While Ms. Gonzales’ story had some publicity, there are many dramas that only few had noticed. Here is one of them, from our case. If you look at the bottom of the second page, you’ll notice that the file in question she (or someone else using/spoofing her IP) was purportedly trying to obtain was “Tsubaki House – SnapShot #05”, which is clearly not one of IO Group’s nauseous movies. 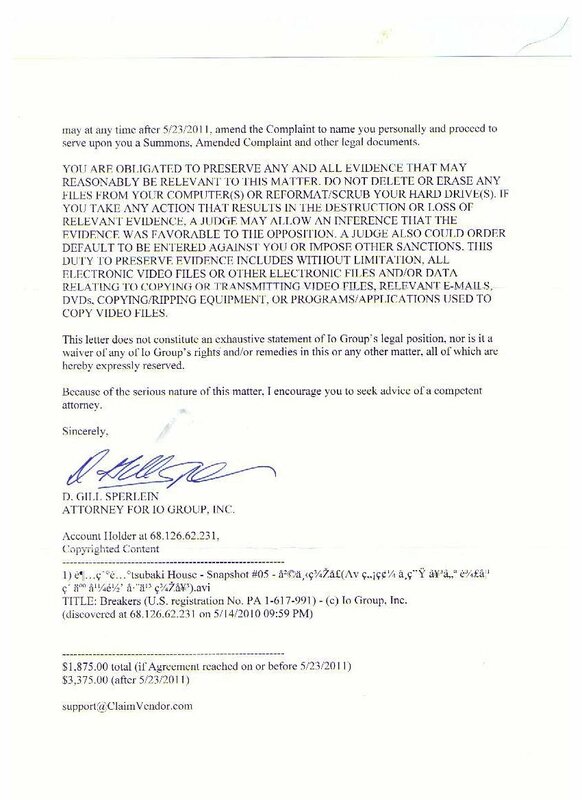 I am an attorney representing Io Group,Inc.,Recently,your Internet access account was used to illegally distribute an unauthorized copy of an Io Group movie using the eDonkey2000(ED2K) network………Io group offers to settle its claims against you for $1875.00 nonnegotiable…………(discovered at 68.126.62.231 on 5/14/2010 09:59 pm). I’m afraid that it will cost more to defend myself than to pay pre settlement fees, What is your advice? The law firm and the lawsuit are authentic. If you did the deed, then you could be liable for statutory damages of $750 to $30,000 per copy distributed, if the distribution was negligent — or up to $150,000 if distribution was willful. If the distribution was accidental, the amount could be as low as $200. 17 U.S.C. § 504. You could also be liable for the attorney’s fees and costs, necessary to obtain a judgment against you, plus your own attorney’s fees and costs. There are also criminal prosecution possibilities, but they are not within the scope of this lawsuit. That would be a matter for the U.S. Department of Justice, and such prosecutions are rarely brought against individuals who have done a single act of copyright infringement. The question that you have to ask yourself is whether or not it’s worth it to fight the lawsuit — but, also whether or not you did the deed? Because if you did not, then you would probably be entitled to attorney’s fees and costs against the plaintiff. 17 U.S.C. § 505. The decision is yours — because only you know the truth — at least, for now. thank you for your help,I payed the settlement fee. the story is end, they win. I don’t have time to make choose. they can get what they want from me because they know what will happen next but I don’t. I will always remember this. thank you again,my friend. Besides putting the presumption of innocence upside down, why did he even mention Christianity? For the vast majority of this country’s population, being a Christian does not necessarily mean being a religious person, but translates to having a calibrated moral compass. American practitioners of major religions, as well as atheists, have their compasses more or less aligned. But Mr. Sperlein’s moral compass points to the other side of the border between good and evil, since huge magnets of greed and cynicism are attached to it. Therefore, I’m repeating my advice: keep communications with this guy to an absolute minimum. He will try to assure you that he is reasonable and caring, but after you say something that can be used against you, he will use your own words to increase pressure to settle. Mr. Sperlein knowingly and deliberately targets innocent people. Look at the list of filenames that alleged infringers thought they were downloaded. 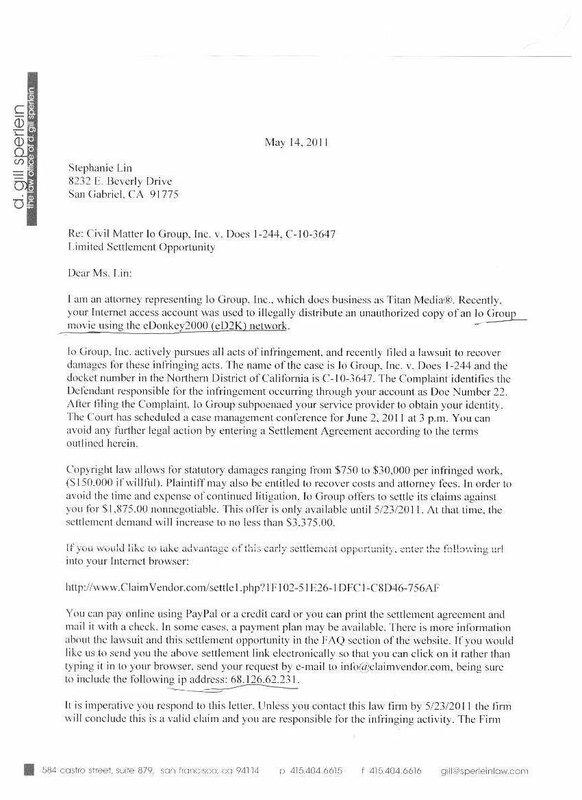 I compiled a list for just a single case out of many IOGroup extortion lawsuits. Pay attention to the purple rows: those are the cases of mislabeled files, similar to the situation discussed above. Even if we assume the accuracy of IP gathering methods is impeccable (which is a huge stretch: the false positive rate may be as big as 30% according to some sources), 31 victim (13%) had no slightest intent to download IOGroup’s obscene material. Nonetheless many paid up after receiving a scary letter like the one embedded in this post. In this light all Mr. Sperlein’s mumblings about “protecting creative works” are cynical, impudent lies. TorrentFreak linked to this post. There are some interesting threads in the comments section.